I always look forward to Christmas mainly because I will get excited about preparing Christmas meal for my in-laws and my family. The usual menu will include appetizer, mains will be turkey and dessert. Sometimes, I will also prepare drinks. And of course, I will seek my helper's assistance in the kitchen for the cutting and washing. I usually do the baking myself. For the appetizer for my in-laws this year, I decided to make a sour cream dip. 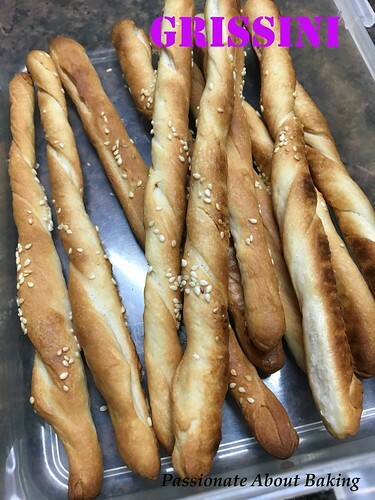 In order to go with the dip, I made Grissini. It was my first time making this. I'm not a big fan of hard and crispy cookies or breads. 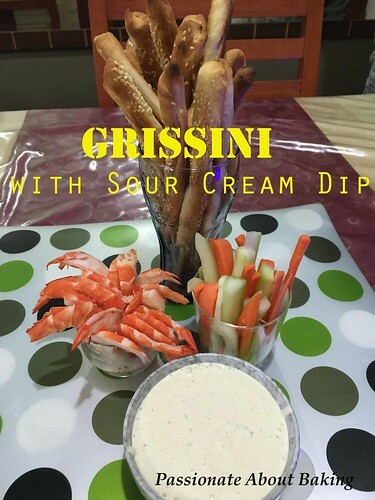 But I figured Grissini will taste good with dips, and it was confirmed when my family loved the combination so much. Recipe for Grissini, adapted from Alex Goh's "The World of Bread." 1. 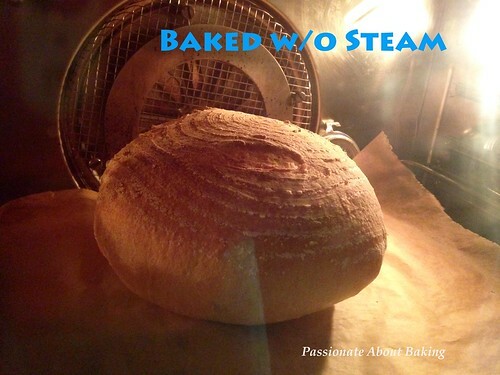 Mix all, except shortening, in low speed to form a rough dough. 2. 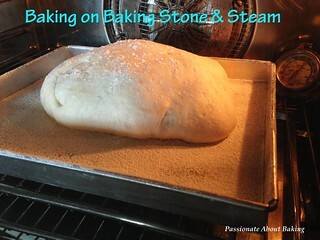 Add shortening and continue on medium speed to mix to form a smooth elastic dough. Approximately 5mins. 3. 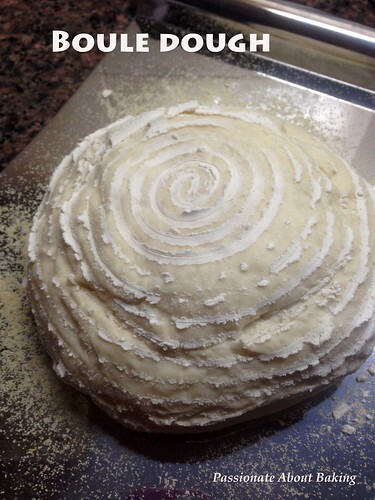 Place the dough in a bowl, cover it and let it proof for 45mins. 4. Mould the dough into a ball, let it rest for 15mins. 5. 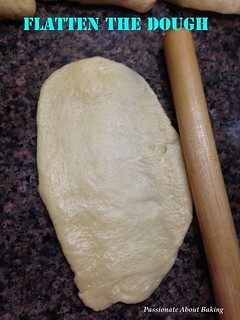 Roll out the dough into a rectangle (L12cm x W50cm). 6. 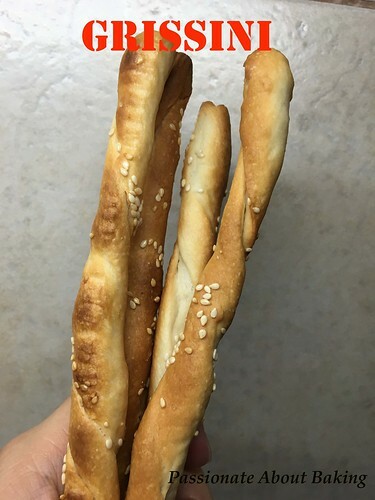 Cut the dough into strips (W1cm x 12cm). 7. Moist the palm lightly with water before rolling the dough. Stretch the dough strips slightly, roll them out about 18cm long then roll them in sesame seeds. 8. Put them on a baking tray lined with baking paper and brush them with water and sprinkle with salt. (I omitted the salt). 9. Let them rest for 10mins then bake at 220C for 15mins. 10. Allow them to cool, then bake at 120C for another 15mins to make them dry and crispy. 11. Serve, or keep them in air-tight container to be served later. To make sour cream dip, fried 2 slices of bacon till crispy, then cut them into coarse pieces. Blend 2 cups of sour cream (400ml) with bacon bits, spring onions and smoked paprika until finely. 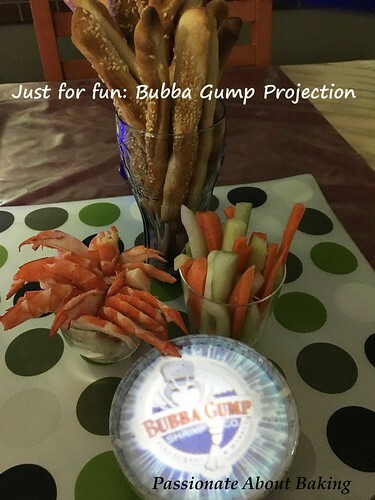 To have more variety for the dip, prepare carrot strips, cucumber strips, cooked prawns and Grissini. Enjoy the feast! I went for a vacation in California during the school holidays to reward my children for studying hard for their national exams - two for PSLE and one for GCE 'O' levels. While I was there, I couldn't resist the opportunity to shop in Costco, a famous wholesale centre where they have in-house brands and sells other famous brands, in bulks. What I looked for are the dried fruits and the nuts. They sell in big packets and it's relatively cheaper, and some, you can't get it locally. 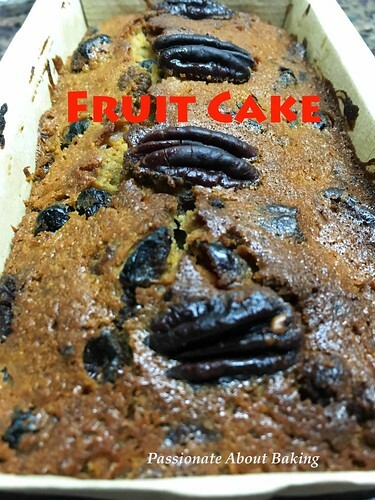 Therefore, with the dried fruits, I decided to bake fruit cakes as Christmas gifts for my friends and family. 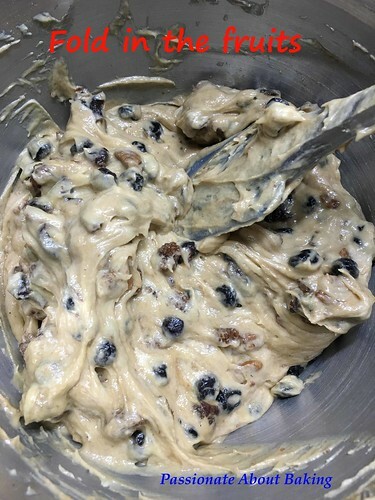 It so happens that my colleague told me about Wendy's white fruit cake, so I decided to use her recipe since I was already thinking of using Grand Marnier instead of the usual Myer Rum for my fruits. 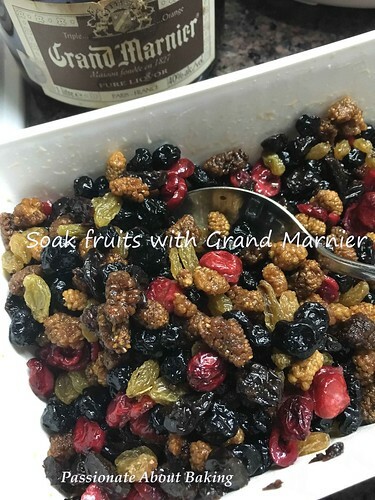 So here's my version of Grand Marnier Fruit Cake. I hope my family and friends like them. 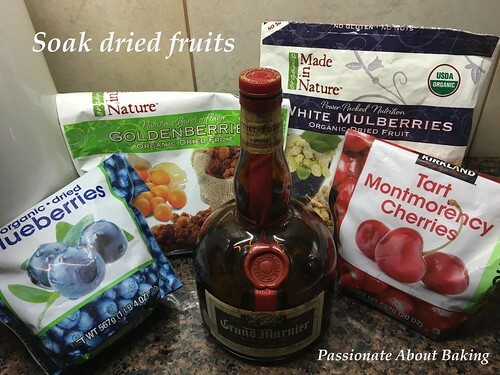 Recipe for Grand Marnier Fruit Cakes, adapted from Wendy. Combine everything and let it soak for at least 2 days. 2. Cream butter and sugar until light and creamy. 3. Put in eggs one by one, beating well after each addition. 4. 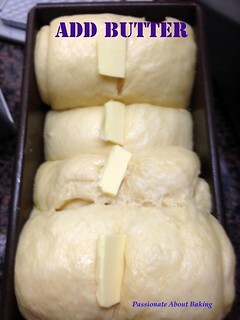 Sift flour into the butter mixture and beat on low speed until no clumps are seen. 5. Fold soaked fruits and all the remaining liquid into the batter. 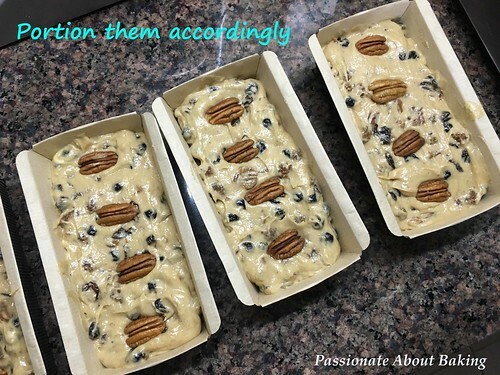 Add pecans and mix well. 6. Pour batter into the pans, level and bake for 40-45mins. 7. Remove cake from oven. Pierce holes in them and brush them with Grand Marnier. Let it the cake air and when cake has totally cooled, keep them in air-tight container. 8. Drizzle more Grand Marnier for the next few days before consuming. 9. Wrap it up and present as a gift. 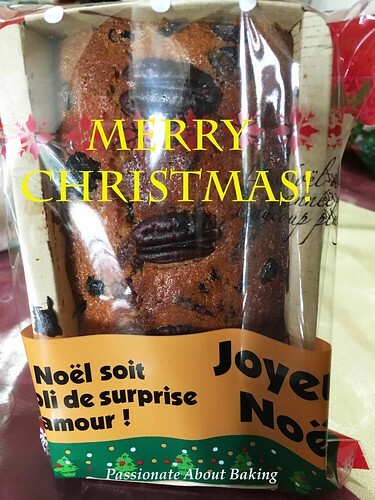 Merry Christmas & a Happy 2016 with lots of baking and feasting! 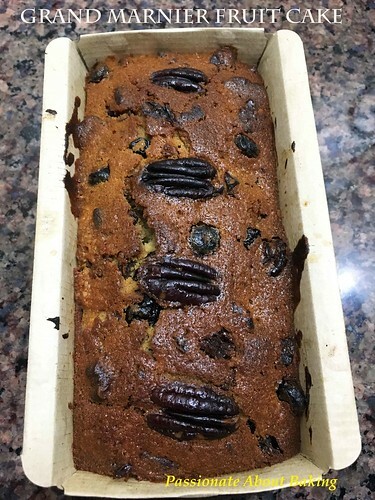 When weekends come, I usually like to bake some desserts to bring over to my mum's place to share with my parents and family members after dinner. Sometimes, there will be request for birthday cakes. These few weeks were not as challenging as there was no requests. So then, it depends on my mood for desserts. 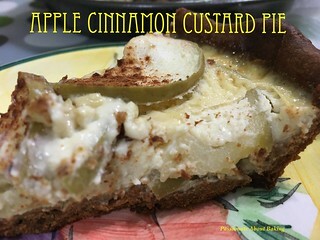 Recently, I was quite hooked on watching Korean dramas, so I'll choose to bake easier desserts. 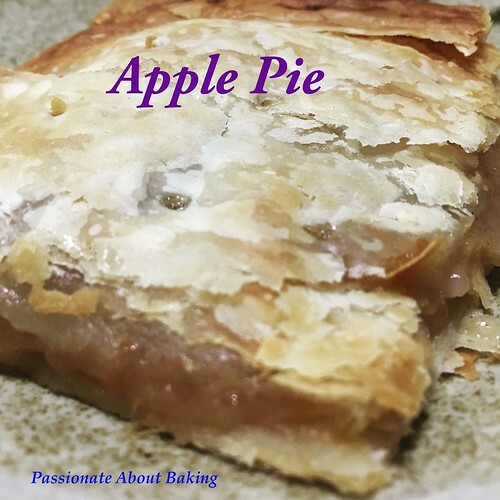 :p *confession* This weekend, I decided to make an easy apple pie. 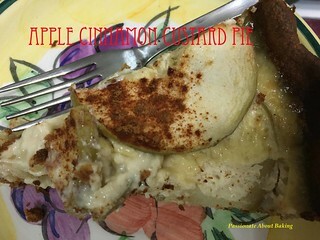 Recipe for Apple Cinnamon Custard Pie, modified from Alex's Irresistible Pastry. 1. Using a spatula, mix softened butter with icing sugar till light. 2. Add in egg yolk and mix well. 3. Stir in flour and mix till all incorporated. 4. 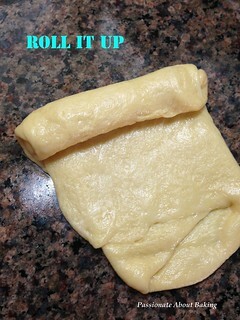 Using a cling wrap, wrap the dough and refridgerate for at least 30mins. 5. Take out and roll between 2 sheets of plastic wrap to about 3mm to fit the 9"pie pan. 6. Chill in the fridge for about 20mins. 7. Meanwhile, preheat oven to 180C. 8. Line the pastry shell with parchment paper and baking beans. 9. Bake in the oven for 18mins, then remove the baking beans and continue baking for another 8 mins. 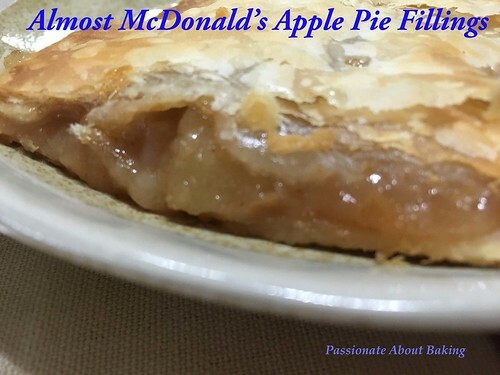 Mix the ingredients well (except apples) and strain into the pie shell. 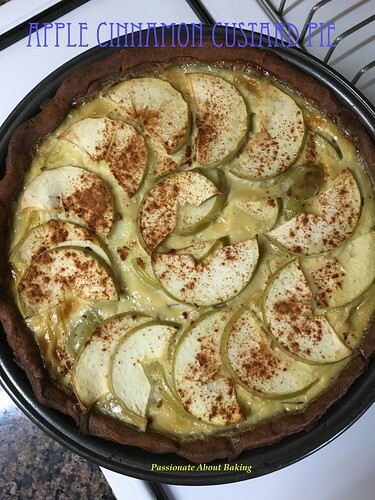 Arrange the apples into the pie. Sprinkle with some cinnamon powder. Bake at 180C for 25mins or until the custard set. 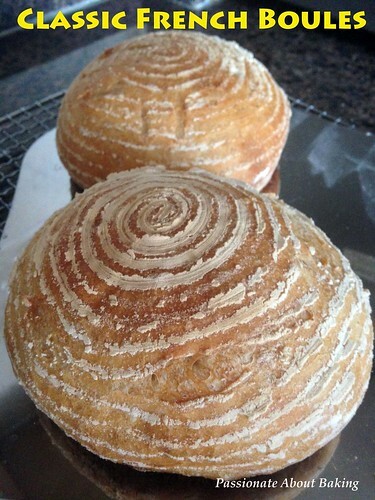 I'm just so into bread baking lately. 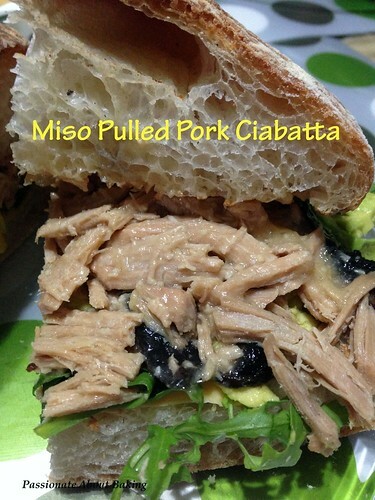 Experimenting with new recipes whenever time permits. 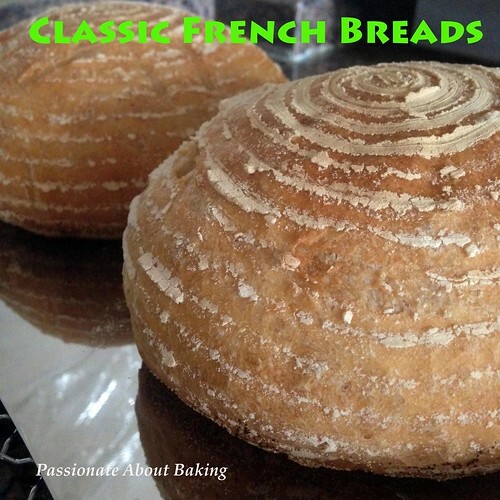 Next up is Peter Reinhart's Classic French Bread. 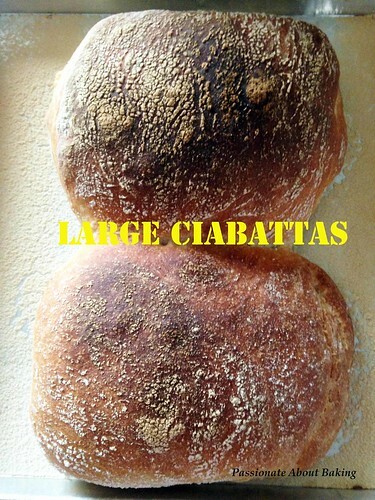 This recipe made four small loaves. 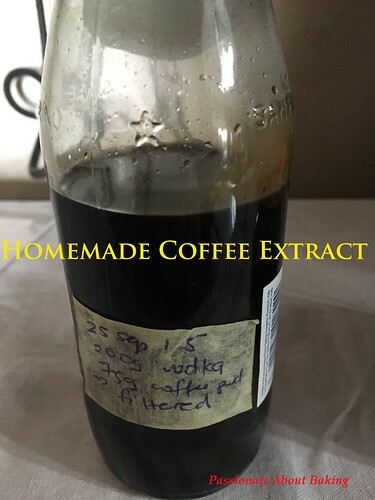 The original calls for overnight fermentation in the fridge up to 4 days. However, after mixing the dough, I split into two. One batch, I baked on the same day, and the other batch, I baked on the 4th day from the fridge. 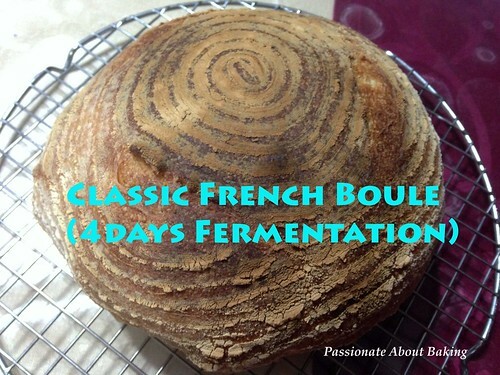 Recipe for Classic French Bread, adapted from "artisan breads every day" by Peter Reinhart. 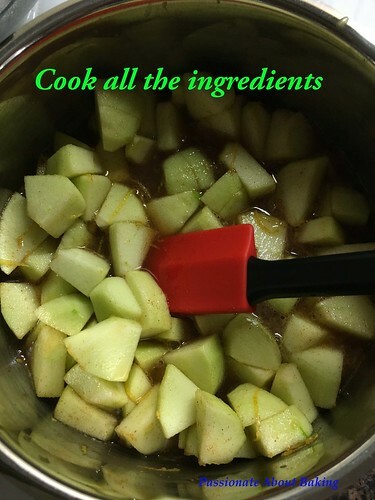 Combine all of the ingredients in a mixing bowl. Use the paddle attachment and mix on the lowest speed for 1 minute. 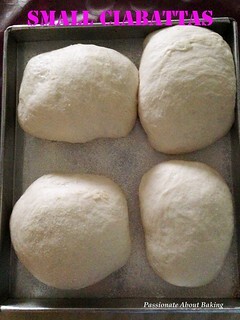 The dough should form a coarse shaggy ball. Let it rest, uncovered, for 5 mins. Switch to the dough hook and mix on medium-low speed for 2 minutes. 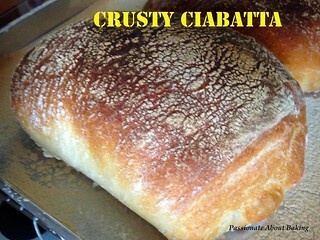 The dough should be smooth, supple and tacky, but not sticky. 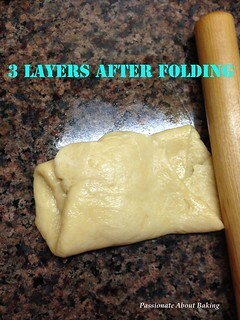 Same day bake: Do two sets of stretch and fold with 40mins resting time. After the second stretch and fold, rest for 15mins. 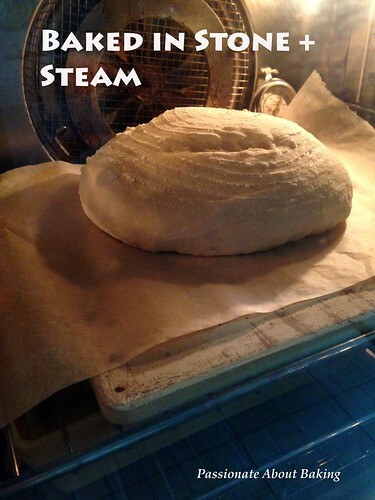 Carefully transferred the dough onto a worktop. 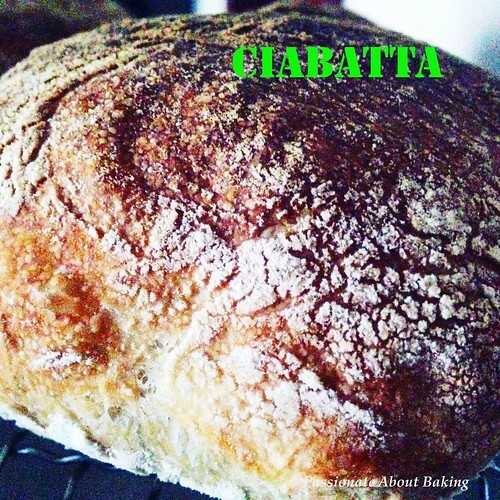 Divide the dough into two. 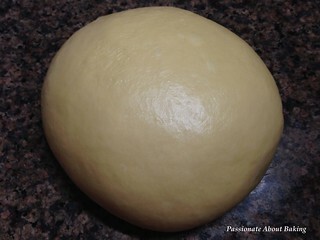 Shape the dough round and placed it in a floured banetton. 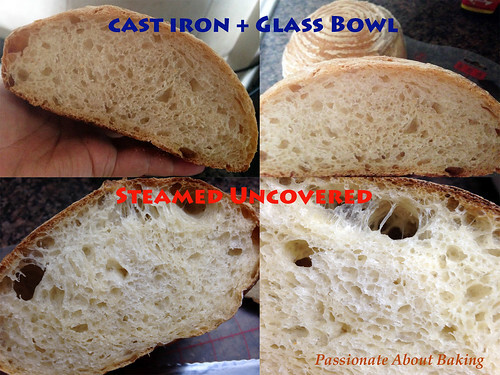 Preheat oven to 230C with cast iron pan. 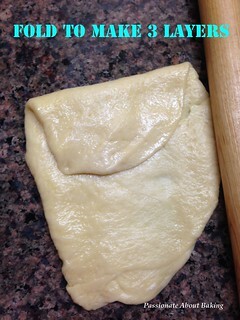 Prior to baking, transfer the dough into a floured peel. Score the dough with a lame. Remove the cast iron pan from the oven. 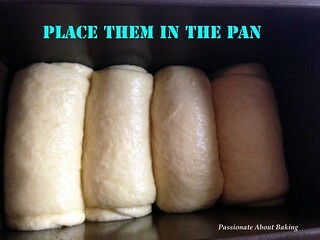 Transfer the dough to the pan. 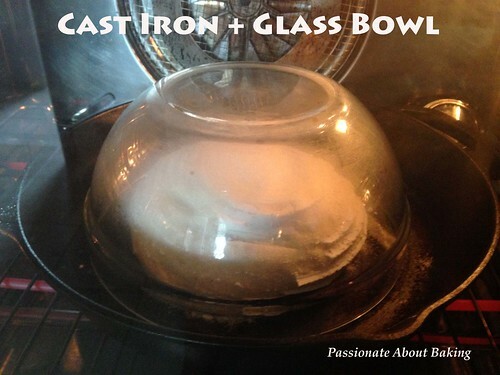 Cover it with a stainless steel bowl or a glass bowl. Bake for at 220C for 15mins covered, remove the glass bowl and rotate the pan, then continue baking for another 10-12mins uncovered. 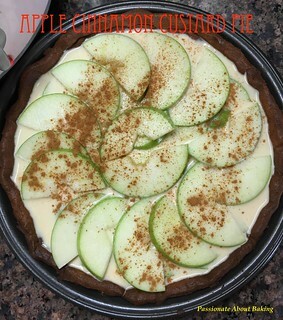 Remove from the oven immediately and let it cool completely before slicing. 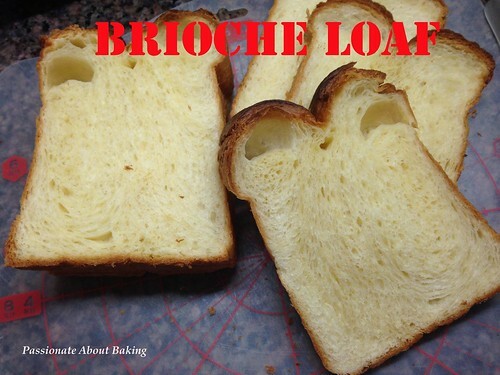 4th day bake: Remove the dough from the refrigerator about 2 hours before you plan to bake. Gently transfer it to a lightly floured work surface, taking care to degas it as little as possible. Transfer the dough to the baking stone. 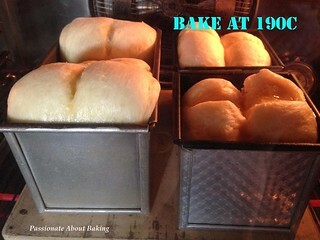 Bake at 220 with steam for 15mins. After 15mins, remove the pan with water. Rotate the pan and continue baking for 10-12mins. 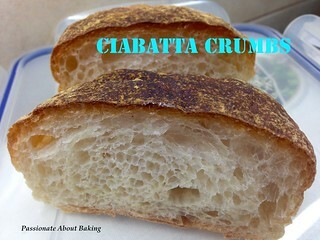 For a crispier crust, turn off the oven and leave the bread in for another 5 mins before removing. 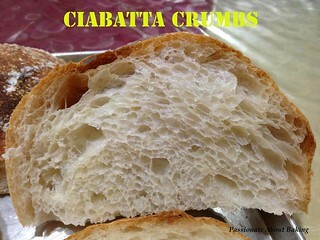 Based on the crumbs, you can actually see that both methods of baking produced almost the same crumbs. 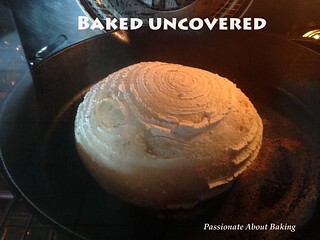 However, the covered boule has more consistent crumbs. It could also due to the fermentation duration. 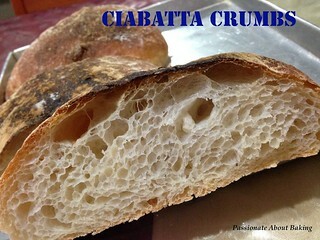 The dough which was left to ferment for four days have strong yeast reaction smell. 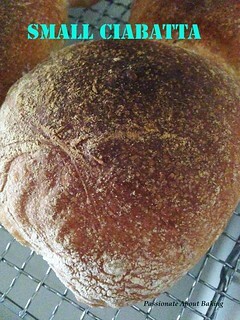 But after baking, it tasted good, like the previous boules. 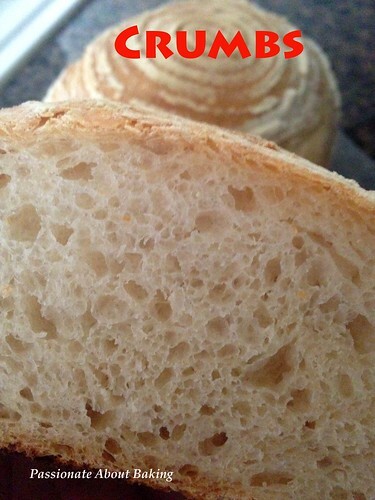 Overnight fermentation was supposed to be more flavourful. However, I really cannot taste the difference. 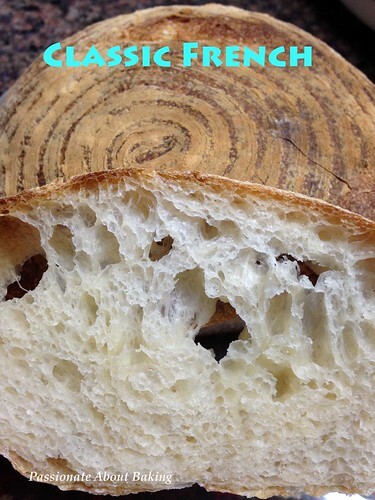 You decide for yourself if overnight fermentation is what you like. 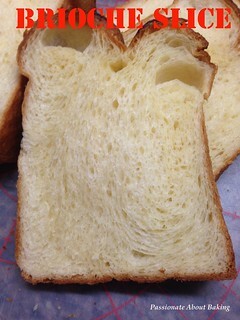 What I know is, this kind of lean bread is definitely healthier and better than sweet doughs.